After you start an activity-based automation, you may want to add or remove subscribers, or give your subscribers more control over which automation emails they receive. In this article, you'll learn how to view subscribers in an automation queue, change an automation's recipients, and add a merge tag to your campaigns or automated emails so subscribers can choose to join or leave a automation. Join and Leave Automation merge tags and the ability to add or remove subscribers from an automation are only available for activity-based automations. Unlike date-based automations, activity-based automations are triggered by the actions of a contact, such as when they subscribe through your sign-up form or purchase a product. To add a subscriber to date-based automations, they need to have data in the date field used to trigger the automation. To remove a subscriber from a date-based automation, you'll need to delete the date data from their subscriber profile. After a subscriber completes an activity-based automation, we continue to hold them at the end the automation queue. Although a subscriber can only move through an automation once, they'll receive any new emails you add to the end of the workflow. When a subscriber meets the trigger and segmentation criteria for an email in an active automation, they'll appear in its sending queue. After a subscriber receives one email in the automation, they'll move into the next email’s queue depending on its segments and triggers. To view the subscriber queue, follow these steps. Click Edit next to the automation you want to work with. Navigate to the Emails step. Find an email on the timeline, and click the Queue link. In the pop-up modal, you'll see all the subscribers in the queue, as well as the date and time they'll receive the email. 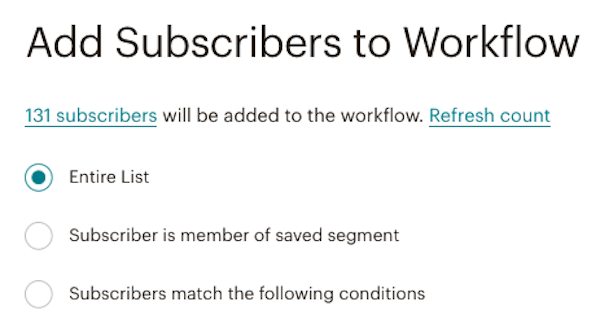 You may need to add subscribers to an automation if your trigger specifications disqualify certain members of your audience, but you still want them to receive the automation. For example, you want existing subscribers to receive an automation, but your trigger is audience signup. You can add subscribers to any activity-based automation, except ones that are in a draft state. Subscribers who have been removed from an automation, or have removed themselves from an automation, can't be added back. To add a subscriber to your automation, follow these steps. Find the automation you want to work with, and click Edit. To add a single subscriber, choose Subscribers match the following conditions, set the drop-down menus to Email address | is, and type in the email address. Choose to add your entire audience, add subscribers from a saved segment, or subscribers who match certain conditions. Click Refresh count to see the number of subscribers who will be added to your automation based on your selection. Click the subscriber count to see a list of those subscribers, to make sure it contains who you want to add. Subscribers will be added to the first email's queue, and will move through the automation. If you no longer want a subscriber to be in an activity-based automation, you can remove them. After a subscriber is removed from an automation, they can't be added back. To remove a subscriber from your automation, follow these steps. Click the drop-down menu next to Edit Workflow Settings, and choose Remove Subscribers from Workflow. Choose to remove all subscribers in your automation, subscribers in a saved segment, or subscribers who match certain conditions. To remove a single subscriber, choose Subscribers match the following conditions, set the drop-down menus to Email address | is, and type in the email address. Click Refresh count to see the number of subscribers who will be removed from your automation based on your selection. Click the subscriber count to see a list of those subscribers, to make sure it contains who you want to remove. Click Remove Subscribers From Workflow. Sometimes a subscriber may lose interest in an automation and want to leave without unsubscribing from all of your email marketing. 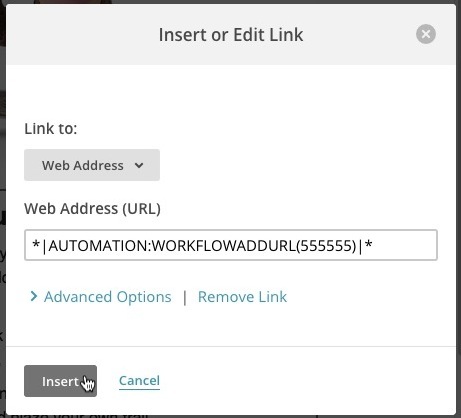 Add a merge tag to campaigns or automated emails to create a link for subscribers to remove themselves from an automation. After a subscriber leaves an automation, they can't be added back to the automation. To add a Leave Automation merge tag to your automated email, follow these steps. Navigate to the Emails step for the automation you want to work with. Add an email to your automation, or click Pause & Edit if you want to work on an active automated email. This will pause your email until you make your edits and resume it. In the Email Designer, navigate to the Design step. Click the text content block where you want to add the merge tag. Add the text you want to link, like "Remove me from this email series." Highlight the text, and click the Link icon. In the Insert or Edit Link modal, paste or type in this merge tag in the Web Address (URL) field. Click Save and Return to Workflow. Click the drop-down menu to the right of the Edit Email button, and click Resume. You may want to review the Automation Landing Page in the Form Builder. This is the page subscribers will arrive on when they click the removal link in your email. If you manage several automations, you may want to promote them to other interested subscribers. Add a Join Automation merge tag for each automation you want to promote in regular campaigns or automated emails. Subscribers can only join automations if they are in the audience associated with the automation. Before you add the merge tag to your campaign or automated email, you'll need to make a note of the unique automation IDs for the automations you want to include. Each merge tag can contain only one automation ID, but you can include as many Join Automation merge tags as you want. To find the automation ID, follow these steps. In the URL for the page, find the number after id= and write it down. To add a join automation merge tag to an automation email, follow these steps. Add an email to your automation, or click Pause & Edit if you want to work on an active automation email. This will pause your email until you make your edits and resume it. Add text that you want to link, like "Add me to this email series." Replace campaign_id with the automation ID you wrote down, and click Insert. Repeat steps 5–9 to add Join Automation merge tags for any additional automations you want to include. Join Automation merge tags also work in regular campaigns. Navigate to the Design step in the Campaign Builder, and follow steps 4-10 previously mentioned to add the merge tag to your regular campaign. You may also want to review the Automation Landing Page in the Form Builder. This is the page subscribers will arrive on when they click the removal link in your email. Automation landing pages are pages we create for you by default, and are different from landing page campaigns. Learn about options for troubleshooting Mailchimp automations.